I assembled my Mini CNC and I'm looking forward for making some controlles GCode movements. Until now it moves, but not as I expect. First of all a descripion of my environment with some specifications. // define the parameters of our machine. #define X_MOTOR_STEPS    200 // to double because of half stepping? X_STEPS_PER_INCH also? // How many temperature samples to take. each sample takes about 100 usecs. 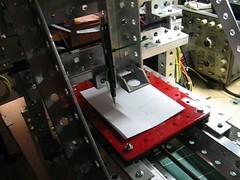 the Mini CNC just makes very little movements, but not movements you can see here for example . I also doubled the values for *_STEPS_PER_INCH, *_STEPS_PER_MM and *_MOTOR_STEPS without any success. 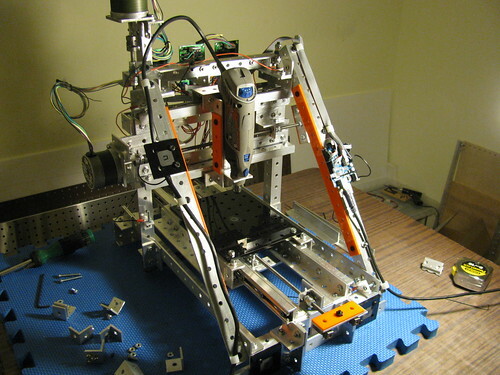 The boards are hardwired to be in halfstepping mode, so your effective steps per revolution should be 400, and steps per inch should be 8000, and values in millimeters should be recalculated accordingly. FAST_XY_FEEDRATE should be something like 20 IPM or its metric equivalent for metric mode. The FAST_ feedrate setting is for G0 command, G1 commands will run at whatever feedrate previously set via F code. Re: Settings for Arduino G-Code Interpreter? I'm just getting very small movements. // E.g. for 300.0 machine would accelerate to 150units/minute in 0.5sec etc. // RepRap stepper boards are *not* inverting. // for the axes which should be inverted. It's attached to the first post by Chris. Ah, that's right - I modified this firmware a bit, mostly removing optimizations of Arduino native functions that he did to fit the code in 16K. I will zip up the version I have and attach it to this thread. I have had this situation several weeks ago with no solution. If I klick "Options" I just get "Permanent Link | Edit | Delete"
PS. : As a mail message I saw that you uploaded a file. Because I remember that you sometimes mentioned that you are using the IDE Arduino 0012, I tried it also with early versions of the IDE (on a 32bit system). 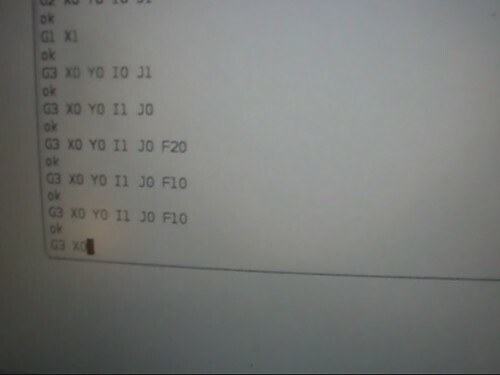 0012, ATmega328 is not supported, the versions above beginning with 0013 thrown all the same error as above. I can't understand how the RepRap people are getting to run there stuff, I didn't find anything recording to all these errors. What a pitty, that there is now ongoing by Chris. Yeah, it's not just _init.pde but other files that are affected as well. Are you running inches or metric? G20 switches to inches, G21 to millimeters. The default mode is millimeters. no real difference with "G20 G3 X0 Y0 I1 J0 F10" or "G21 G3 X0 Y0 I1 J0 F10"
Yeah, that's it!!! Uhh, I have to learn GCode syntax! I will document all this step by step for dummies like me. Sorry I should have written this up as I think I struggled with it as well in the beginning. But it was a while ago, and things start seeming obvious even though they're not. not a perfect circle as I expected, more like two separates curves, but much better than I expected today! Good night for today and thanks a lot! I think what's happening is: because the limit switches are not connected, the noise inducted in the logic wires is triggering the limit switch inputs on Arduino. To prevent this, connect the limit switch plugs to the board - they include pull up resistors (well they have to be soldered). This defaults the limit switch input to 5V. with limit switches (= pull up resistors on Min and Max) I don't have floating inputs anymore and I'm starting drawing awesome circles :-D I will post some video. Thanks for your help and patience :-) Shortly I will amend some passages in the according chapters. Also I will mark this thread as solved.